With the best truck line-up assembled for an international stadium performance, the show will feature eight of the world’s most famous Monster Jam trucks, including Monster Jam World Finals® champions Grave Digger® and Max-DTM, providing an unforgettable experience for the entire family. Monster Energy, Gas Monkey GarageTM, Megaladon®, ZombieTM, El Toro Loco® and Monster Mutt Dalmatian® join the larger than life spectacular that takes place on specially-designed tracks that optimise mobility so the most recognisable trucks in the world can go head to head in wheelies, donuts, obstacle course racing and freestyle competitions pushing the Monster Jam trucks to their limits. El Toro Loco is one raging bull who can the smell fear of its competitors. Driver Becky McDonough is one of the outstanding female Monster Jam drivers and the first ever Monster Jam female crew chief who also holds the 2013 Arena Wheelie of the Year title. Don’t be fooled by the cute ears, tongue and tail of Monster Mutt Dalmatian, the Monster Jam truck driven by fellow female driver, Candice Jolly. This “puppy” is ferocious on the track! Look out for Bari Musawwir as the ever-popular Zombie comes back from the afterworld to rev up the competition while Linsey Weenk drives Gas Monkey Garage based on the garage made famous in Discovery Channel’s hit television show, Fast N’ Loud. 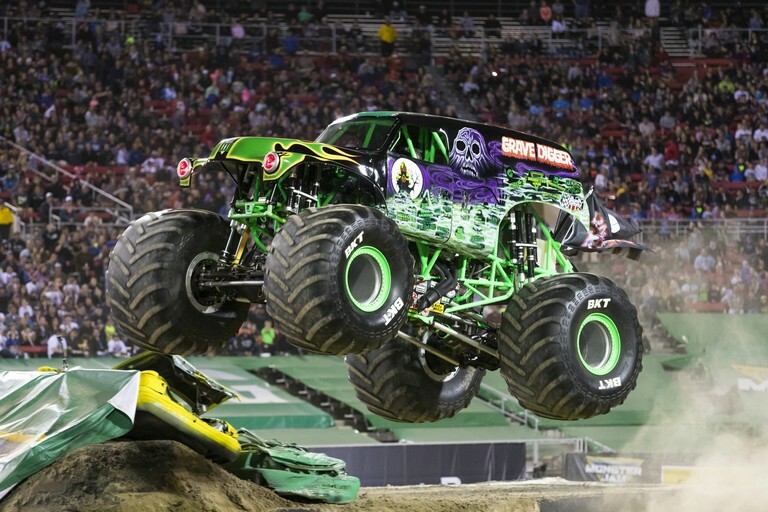 Driven by Charles Pauken, Grave Digger is one of the most decorated Monster Jam trucks in the world producing championship winning racing. Possibly the fastest machine in the sport, Max-D is driven by Colton Eichelberger but the title of the most menacing looking Monster Jam truck must surely go to Megaladon, driven by Chad Tingler. Steven Sims drives Monster Energy, the machine that represents a high-profile product with power, drive and of course, loads of energy! Radio, Kfm 94.5 and JacarandaFM, Monster Jam is also known for its pre-show ‘Pit Party’, giving the crowd unprecedented access to the stars of the show. Fans can meet their favourite drivers, get up close to each Monster Jam truck, participate in a variety of fun activities and purchase official Monster Jam merchandise such as flags, t-shirts and hats to show support for their favourite truck, team, and driver. Tickets for the Pit Party cost R150 each. Quantities are limited and available only with an event ticket. A Pit Party ticket is included in the exclusive Premium Lounge tickets at R800 per ticket. The Pit Party is from 1pm to 3:30pm with final entry at 3:00pm. Two-wheel competition – drivers are given time to show off their best two-wheel moves. Each driver gets two attempts.